Lisa at The Whimsical Bohemian is once again hosting her fabulous One World One Heart spectacular in which bloggers all over the world give something away for free with nothing to gain–no self-promotion–no tweeting–having to follow–just a comment to say hello and leave an email address. What a great way for people everywhere to get a peek into each other’s lives. My name is Beka, and I live in sunny Southern California with my husband and three kids. My husband is self-employed, and I am a stay-at-home-mom. I love all things thrifty and vintage. I think if I won a million dollars tomorrow I would still be a thrift shopper, just for the thrill of those unique items you never see anywhere else. I found out about OWOH last year and gave away a handmade bracelet to a lovely blogger in the Philippines. I was also lucky enough to win a couple of great giveaways too, which you can see in this post. This year I am giving away a very simple necklace I made with a few beads strung on about 18 inches of black cord. The centerpiece is this beautiful vintage religious medal which I find very touching. The back side says “St. Dominic Pray for us” and features St. Dominic in a cowl, with flowers in one hand and a book in the other, but the side that I love features this beautiful Madonna and child and says, My Mother My Confidence. I think it is a sentiment that anyone who has ever had a mother or been a mother can share. Keep it for yourself or give it to a mother in your life. If you are interested in the necklace, leave a comment on this thread, by 9 p.m. California time on February 17th. You must be an active blogger (with a link to your blog, so I can find you) in order to win. I will have a random drawing on February 17th to pick the winner, and I will contact the winner to let them know. If you would like to see more participants in this giveaway, check out the One World One Heart blog page. Today, at midnight Pacific time is the last chance to giveaway, but you can still enter to win any of these marvelous giveaways until February 17th, so go check out all the wonderful bloggers out there! ~ by bekaboo on February 12, 2011. Glad to meet you on my OWOH journey, Beka. Beka, you are so sweet! And this necklace is lovely and darling. The necklase is simple, but has a lot of style! So please enter me in your draw and I am glad you joinede the OWOH-tour on the last day. You have such pretty photo’s on your very fun blog. Thank you for your kind comments to me. I am thinking of going over to wordpress soon. Is it fun? lovely necklace- gorgeous focal medallion! please enter me in your giveaway and come enter mine! Great giveaway! please count me in thanks! Hello! I’m so glad I found One World One Heart and was able to visit your blog! I’m pretty new to the blogging world and I love seeing the different ways of blogging. I hope you will check out my blog and maybe find something useful there. I’d love to be entered for your door prize, thanks for adding my name to the list! I love the medal, hope you are enjoying the ride. Please call on me at #100 if you have the chance. Please enter me in your giveaway-and do drop by my blog and enter mine. Hello, it’s lovely to meet you and your blog, I love the necklace, count me in! Love your creativity. Hope you have oodles of fun during OWOH. I’ve enjoyed it so much over the years seeing all of the wonderful blogs and meeting everyone. Thanks for your participation in the event. Wow what a great giveaway! Thank you for the opportunity to win! Now off to peruse your blog! It’s so nice to meet you — don’t you love this event?! I hope you will visit my blog, too! Lovely necklace..sometimes simple is better. Please add my name to the draw and fly on over for a visit to number 92 where a clay fact planter awaits. Greetings from Northern Virginia, USA. I’d love a chance at your prize! Thanks. Wow! The necklace is wonderful! Hello from NY. What an amazing giveaway. I love religious medals. Thank you for adding my name to your giveaway. What a beautiful necklace and thanks for the chance to win! Please visit me at Irish Muses #678. Hello from Idaho!! Thank you for being apart of the OWOH journey across the world! I’m travelling around the world thanks to OWOH. Nice to meet you and your blog, Your prize is just stunning !!!! I would loooooove to win. Keep my fingers crossed. it’s nice to meet you. I would love to be entered for a chance to win your beautiful necklace! Also, please come by and visit my blog if you get a chance. That necklace is stunning, I would love to win. Come on by my blog & enter my OWOH giveaway also, I’m #590. I love the header of your blog, it’s so cute! This event has lead me to many, many wonderful new blogs such as yours. I wish I knew about this sooner. Nice to meet you and read your blog!!! Please enter me in your giveaway (my email is in my profile) and stop by my giveaway if you like. Hi beca..your giveaway is just beautiful…would love to be entered into the draw! Your giveaway is gorgeous… please include me! You have a wonderful wonderful blog!! I love the piece that your giving away. Its simple yet stunning! Great job and your other projects are just as wonderful as well. It is my first year OWOH and I love meeting everyone. Your door prize is so sweet, especially as I just became a mum for the 3rd time. Nice to meet you! Love the necklace, please throw my name in the hat, I’d love to win!! I’m #521 if you are flying around blogland, and would like to meet me. What a lovely pendant. Please inlcude me in your drawing. Hi there. Glad to have the chance to visit you. Your giveaway is lovely. Hi Beka, your necklace is beautiful. Thank you for the opportunity to win it! Beautiful! Please toss my hat in the ring. Come stop by my place if you get a chance. Thanks! You say this is simple? Oh my gosh I love this, I have gotten so I love silver and different jewelry and I love the vintage feel of this necklace. I am sooo hoping to win! I do hope you will also come and visit my blog #259! What fun! Please enter me, lucky #870 on the OHOW list, in your give away! I am so excited to visit and explore your blog! 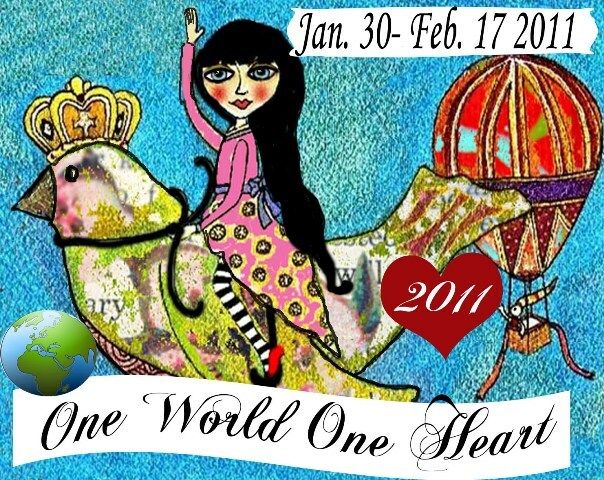 Don’t forget to enter my draw at HERE http://lenorita-lenoramoore.blogspot.com/2011/02/one-heart-one-world.html/ by February 17th! Thanks! happy valentines!!! its a lovely necklace! hope I get lucky to win it! Hi Beka. Thank you for welcoming me to your blog. Your necklace creation is lovely! Hello from Iowa, it’s nice to meet you. I enjoyed stopping by your blog and would love to be entered in your giveaway. I’m thrilled to meet a potential kindred spirit! I look forward to reading more of your blog. Thank you so much for finding me via my OWOH post. It’s been amazing and difficult to keep up and get around, but all in all – very happy I participated. Hi Beka, I’m visiting from #559. I love the simplicity of your necklace. It is very lovely 🙂 I do hope you’ll get a chance to drop by. Please come to visit with me when you get a moment. I love my visitors. Hello. It is so very nice to meet you. Your necklace is absolutely beautiful. this necklace is so beautiful! i love the beads you have chosen to go with this lovely pendant. what a gift! great prize, I am visiting from the Florida Gulf Coast area and it is so nice to meet you.. if you get a chance stop by for a visit. What a thoughtful and thought provoking giveaway. I’m so glad that I visited your lovely blog! Good luck in all of the OWOH giveaways! What lovely work, I collect vintage religious things! I am thrilled to enter. Happy Valentines Day ♥ Mwah! I hope you are enjoying the OWOH. I know I am. You’ve got a great blog and such a wonderful prize. Thanks for the opportunity to win. Lovely work! Jewelry is my THING!!! Hi, it was a pleasure to meet you, and visit your blog. It would also be a pleasure to win your lovely necklace. Please enter my name. Cheers! You have here a very nice Blog. And your Giveawy is great. Please, writes me on your list. Greetings from Spain and thanks for the chance! Hi Beka, greetings from Australia. Great to meet you and visit your blog. I would love to be the lucky winner of the lovely medal which I would be proud to wear if I were the lucky winner. Please come by #9 and say hello. This is really beautiful. Please add my name. That’s a lovely pendant. There are so many wonderful mothers and daughters in my life. If you find the time, please come visit my OWOH posts as well – I’m #865 and #866 – just squeaked in under the wire this year. Hi Beka, so lovely to meet you:-) Please add my name for your giveaway, I would so love to win your gorgeous necklace!! Make sure you come by my blog to enter my own giveaway if you haven’t already. I love the vintage religious things and they are getting harder to find. This one that you made into a necklace is especially lovely. Please add my name to your generous give away and come visit me at lucky #777 on the long list. Such a lovely necklace – beautiful work. Please enter my name in your draw, I’ll hope you’ll pop by to visit me at OWOH #325. Aloha from Hawaii! Please enter me in your drawing. It is so lovely to meet you! Feel free to stop by my blog sometime. What truely gorgeous work that necklace – Yes I think I could picture wearing that and just who wouldn’t. Lovely blog. Put me in your draw and pay a visit to my blog and enter my giveaway too. Hello from Cody, Wyoming, USA. It is taking me a long time to get through the blogs (I am working backward now just for fun) as I have to read and browse so I don’t miss some awesome eye candy or words of wisdom. Isn’t this event fun? I am having a ball with it. Your necklace is lovely. Please enter me in your drawing. That’s a very pretty necklace. Count me in please. Hi Bek, greetings to you from Australia! Thank you for sharing with us on the OWOH trip. I would love to win, please count me in! I hope you will visit me, I am OWOH 248! Hi Beka,love the necklace! I agree with you, even if rich I would love treasure hunting in little junk and antique shops! Lively the OWOH!!! So thanks to Lisa we can discover the other blogs so creative as yours for example!!! What a great find! (yes thrifting is so much fun! Count me in for your give-a-way, and I hope you can swing by and visit me as well. You have a lovely blog. I really love that necklace. Please enter me in your giveaway and visit me, if you haven’t already. I’m number 11 and my information is on my profile page. MY NAME IS DEBBIE AND I LIVE IN THE GREAT STATE OF OKLAHOMA. I LOVE YOUR SIMPLY STUNNING NECKLACE AND IT WOULD MEAN A LOT TO ME. I WILL BE JOINING YOUR BLOG AND I HOPE YOU WILL STOP BY AND SEE ME AND CONSIDER FOLLOWING MY BLOG. I KNOW IF I WON MILLIONS I WOULD STILL SHOP THRIFT STORES, GARAGE SALES AND ESTATE SALES. I MIGHT BUY SOME THRIFT STORES. I BET YOU CAN FIND A LOT OF UNUSUAL THINGS WHERE YOU LIVE. So precious and beautiful! Thank-you for playing in OWOH..
What a great blog you have here! So happy to have found it via OWOH! Lovely blog and lovely giveaways…I hope I win. This is a lovely necklace and I would be proud to wear it. This is so gorgeous and very symbolic too! Please enter my name in your draw and come on over to mine-#348 and add your name if you wish. Thanks and Good Luck! Oh I would love to win your pendant. It is precious enjoy the journey. Hello from New York! Your give away is very beautiful It’s nice to find your lovely blog. hello, i’m so glad i visited your blog in time for a chance to win your lovely necklace giveaway! if you haven’t yet, i hope you can come and visit me at http://peggyapl.blogspot.com and join my OWOH giveaway. What a pretty picture! I like that thanks for the chance Beka! I’d be honored for you to follow my blog! Very special…Please enter me into the OWOH give away. I hope you can visit my blog, too. I’m giving away a shabby chic denim necklace. Come chat any time. Thank you so much for stopping by… can’t believe I’ve missed you and not visited before! I’ve soooo enjoyed exploring here and will definitely be back. Your gift, in celebration of this incredible flying adventure, is gorgeous! Hi my name is Sharon and your necklace is just wonderful. i hale from Tn and it is so very nice to meet you. I hope we can chat at one time or another. I am entering for my daughter Melanie, she had wanted to participate in this year’s event, but a fire changed her plans… I thought I would surprise her and do this for her..
Hi Beka! Thanks for stopping by my blog. I love your photography. I am going right now to become a follower. I am having an artsy GTG at my home next Saturday. Send me an email if you would like to come. I don’t know all of the ladies coming, I met them through blogs and on-line art groups. I am trying to form a monthly group to get together and create community and friendship through art. I make jewelry with found objects and vintage jewelry parts too, especially religious medals and rosaries. LOVE to hit the flea markets if you ever need a shopping buddy! Karan, A great group of girls is going to the Rose Bowl on March 13th if you would be interested. We all met online. We used to be scrap-bookers–all are artists/bloggers of one sort of another-I bet you would have a great time. I will let you know about next Saturday. I may be committed to sell girl scout cookies. We are on a quest to get our girls a trip to swim with the dolphins! I have your blog bookmarked and will be a follower soon (takes me a while to get the tech stuff done). I am off to volunteer in the classroom. So glad to find a kindred spirit. 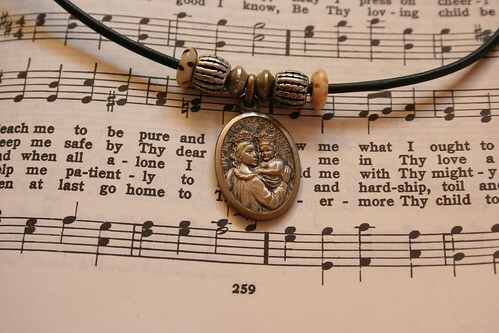 I adore religious medals and rosaries!! There is a great shop here in Fullerton-Gilding the Lily. Do you know it? Here is the owner’s blog: http://gildingthelilyvintage.blogspot.com/. Such a generous giveaway! My Catholic self would love this! And would be honored to wear such a beautiful item. thank you! thanks so much for offering this! I’d love to win! thanks for visiting my blog – I already had my giveaway but do have another one for the month of February http://myheartartbygeri.blogspot.com/2011/02/what-another-giveaway-yes.html All you have to do to enter is become a Follower and leave a comment. I sure had fun on OWOH, hope you did too! Very fun blog you have here. Love the Halloween photos. Thanks so much for coming over to Turn left at the Pigs. This is a great medal necklace. Hello.. and what a generous and fab blog you have.. you totally rock!